This post is about “what we did”. I’ve written about behaviour a few times before, most recently after seeing Tom Bennett speak at the Festival of Education at Wellington. Over the last year I’ve become increasingly proud of the school I work in. As a result, I’ve definitely managed to be more forthright about my views on social media, and have engaged in the unfortunate tendency to post things like “we do this, and it works”, reflecting my increased pride in my school. I love Kev Bartle’s recent blog on leadership, but can’t help but feel we need established, consistent systems before getting close to the sort of thing he writes about. My school is not outstanding. It’s not going to achieve an Outstanding judgement in its next OFSTED inspection. It has a long way to go. However, in my judgement we’ve gone in 18 months from a school guaranteed to get a 4 to a school with an argument for a “good” judgement. Context To say I work in a school in challenging circumstances is understating the case significantly. In the Year 11 cohort that just left (165 students) we taught 280 students. I have been rereading Hirsch’s The Schools We Need recently and in there is reference to some schools in the US with over 100% transient population – we’re not quite at that level but our churn is of significant challenge that I have not come across anywhere else in the UK (“off the scale” is one way I’ve heard it described). Our cohorts are significantly below the national average for ability, and in the context section of Raise we are at the most challenging quintile in every category. Very few of our most recent intake were “high ability” students. We became an Academy last year under an Executive Principal who is Head of another local (and high performing) school. Prior to that, the school was under a Local Authority Warning Notice. It’s fair to say that the pressure of stagnant results, declining roll, and a Local Authority who did little to dispel the idea that they were out to “get” the school created extraordinary pressure on our Headteacher. I remember thinking “if OFSTED come now, we will lose our jobs”. The Senior Leadership Team did not sufficiently oppose the pressure from the Local Authority. In fact, I would go as far as to say we magnified it. The school was an unhappy place, largely because of the threat of OFSTED combined with our poor leadership. I do not know what I would have done if I had been Head at that time – she was backed into a corner and it was a really horrific way for someone I have enormous respect for to have retired after many years of service. Our staff are great. Despite the pressure that I regret us foisting on them (and I’m not opposed to putting pressure on in different circumstances, but in this one it was the wrong pressure, of the wrong amount, at the wrong time) they plan and deliver lessons of a high standard. They work hard, follow direction, question and search and strive to be better. There are very few “door handle planners”. I genuinely think that the wider staff could and would have come up with these same priorities. Since the school has tried everything in the past to deal with being a school in difficult circumstances – learning styles, student observations, learning walks, high stakes observations, low stakes observations, interventions from 7am-9pm including on Saturdays, Mocksted, Local Authority secondments, “Lazy Teaching”, and heaven knows what else, we were ignoring what Tom Bennett calls the elephant in the room. I saw my Executive Principal speak at a Teaching Leaders event where he said “schools in challenging circumstances are usually challenging because they face challenging behaviour”. I think we’d been conditioned to ignore this and try to deal with everything else while hoping behaviour got better – and really the Leadership Group should have been shaking each other and screaming the problem “It’s the behaviour of the students, stupid!” It’s been the case that our behaviour system (via SIMs) has been well used to track behaviour, but that’s it. This goes back to a staff working group a few years ago. Stuff gets recorded. Briefly, it’s 1 Behaviour Point if it affects the student (eg late to lesson, lack of equipment), 2 Behaviour Points if it affects others’ learning (eg talking back), 3 Behaviour Points if the behaviour is a risk to health and safety. But despite the recording of behaviour incidents being good, the follow up wasn’t. Students were just recycled into the system (via it being the classroom teacher’s responsibility, then subject leaders, then whoever but by the time it got to that, most people had forgotten about the behaviour). Internal exclusion, or seclusion, was used regularly. Parents meetings happened. 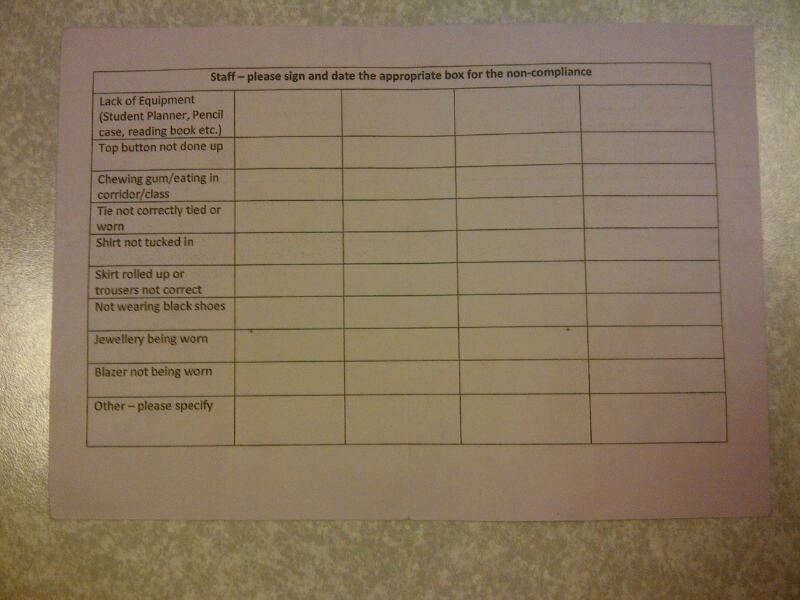 But some students had accumulated over 700 behaviour points in the previous year, and staff were frankly sick of it. I led a whole middle-school assembly on the first day introducing my new role. I then outlined the students’ responsibility, which I handily proclaimed A, B, C. Analyse your work. Behave. Correct your work. I then promised that if others stopped them from doing this, we would remove them from the classroom. Partly to prove they were doing it, we expected their student planners (previously barely used) to be on desks in every classroom. We then logged how often each member of SLT went into classrooms. We still do this. We are not monitoring staff, or quality of teaching. We are checking students have planners on desks and the question I ask is “Excuse me Sir/ Miss, is everything to your satisfaction in here?” If the answer is not yes, we encourage the member of staff to send the student out and there is no negotiation, no returning the student to the classroom. If a student is found outside of the classroom, the only question is “would you like me to take this young person away” and if the answer is affirmative we do. Every time, including with supply teachers. If there is a mobile phone incident, we encouraged staff to make it a big deal. Confiscate every single time, and parents could collect after 24 hours. If a phone went off and wasn’t handed in, the Leadership Group were called and we would search every student and their bags and confiscate all mobile phones found. I’ve previously written about my brother, and the fact that I believe that if his school had permanently excluded him, he would not have gone to prison as a young adult. So here was a line: If students accumulate 25 behaviour points in a half term, they would have a fixed term exclusion. In addition, students who were a minute late for school had an automatic 20 minute detention after school the same day. No excuses. It would have been easy to have made exceptions to this line, given that I signed off over 80 exclusions in the first half term. In fact once we got to half term, I realised that a number of students had got to 20 points within 2 weeks, and then behave to not get excluded. So I made a decision, which I announced in one of my whole school assemblies, to reduce the threshold to 20 points. I then ratified this at our next Leadership Group meeting. The threshold became more demanding. And in the second half term we had many exclusions, but it was less than 80 (I don’t recall the figure). If a student was excluded twice, they’d usually be coming back from the second exclusion to a “final warning” which they would sign in front of me. I had to hold my nerve a number of times and we “moved on” a large number of students in the last academic year. I am not sure if I should put the number in the public domain, but this was necessary. If we had to, we permanently excluded for persistent poor behaviour. Exclusions went down half term by half term. With one exception: we had a serious incident in public in the last half term. It was actually “useful” because it allowed me to really stamp the school’s authority on our most troublesome year group. There was a fight, and a large number of the year group had watched it, with some filming it. The next day, after a day’s investigation, I ended the school day early and did an assembly with a clear message. I told the students about my brother, and told them it was because I care that I would be very harsh. We excluded 19 students just for being at the fight – all of whom were given final warnings (and I mean these – the students have seen enough of their peers not return to school and they now value their place at our school). Those directly involved (3 of them) we moved on permanently. The system evolved. Students who get to 7 behaviour points are placed on form tutor report. Students who get 12 are placed in all-day seclusion for between 1 and 3 days (with a re-entry meeting with parents). Students who get 20 continue to face a fixed term exclusion. Every behaviour point is sent in a text to parents. We’ve upped the expectations again. 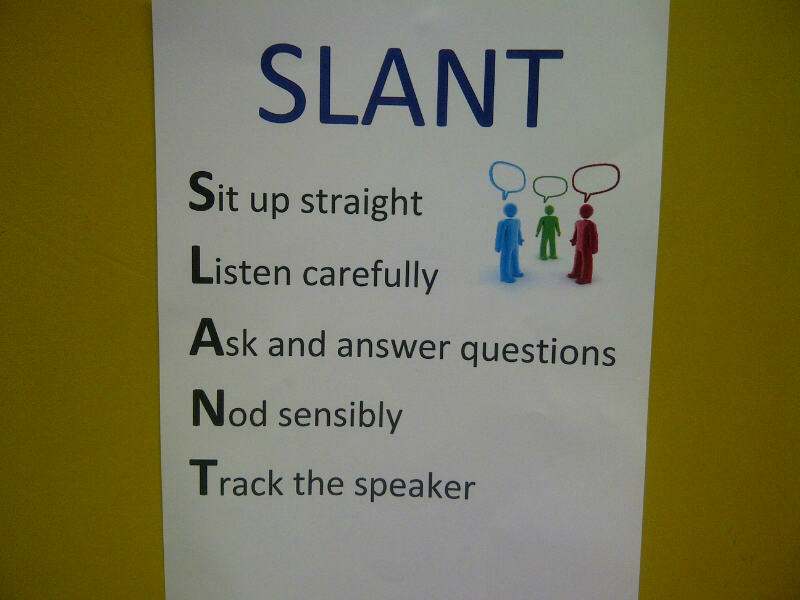 First, we introduced SLANT, a technique outlined in Joe Kirby’s blog and emanating from Doug Lemov’s excellent book Teach Like a Champion. Second, we introduced a Saturday detention. If a student gets 4 punctuality detentions, they then have to attend school on Saturday, in full school uniform, dropped off and picked up by their parents. Third, we introduced a new uniform. 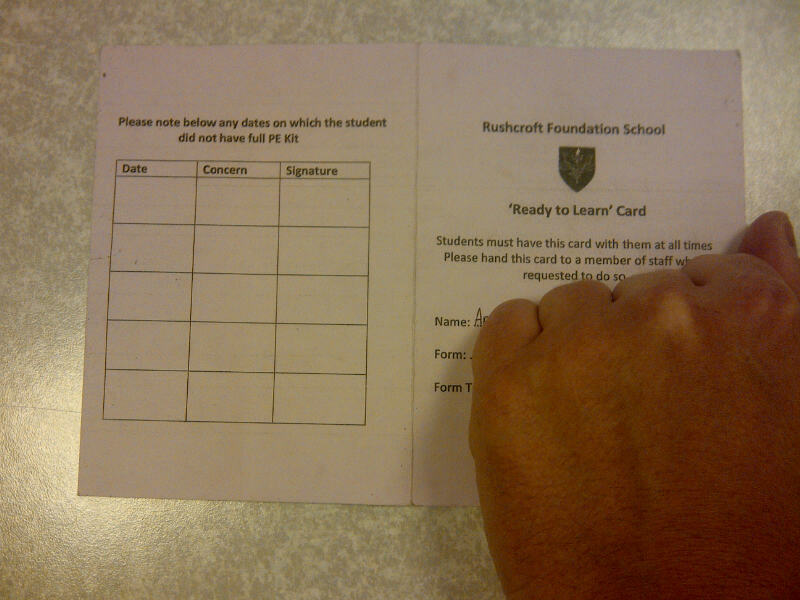 To go alongside that, we introduced a uniform card, which we named “Ready to Learn” card. To support this, we introduced (at the suggestion of staff) a 5 minute afternoon registration. If a child is chewing, or has their top button undone, or isn’t wearing their blazer, or anything else, their Ready to Learn card is signed. If they don’t have it on them, it’s an automatic 1 hour detention on Friday with me. The detention is sitting in the Hall (which is very public) on the floor in silence after school. If a child has a signature on their ready to learn card, the tutor keeps them behind for ten minutes after school. No chances, just certainty of action. If they have two, they are in Middle School detention with me on Friday for 30 minutes (which includes a personal lecture at the end), 3 times is an hour. 4 is consideration if they are doing their job and consideration of a seclusion or exclusion. The first week of this term, I had 11 in Middle School detention. Since then I’ve never had more than 5. Most weeks it’s 2 or 3. Students have raised their performance to meet expectations to the extent that the Student Progress Leader in Year 9 now gets all Year 9s who receive a single behaviour point for home learning to attend the detention for an hour. So this all sounds very Gradgrindian and horrific. On the contrary, though, a colleague said to me during break duty a couple of weeks ago “if you saw students in large groups, you used to be really wary… now though, they’re invariably laughing and joking”. Anecdotes like this are not uncommon. I noted on twitter one evening “I can’t describe how much happier the students appear to be”. The old maxims about students requiring stability and structure really are evident. One colleague, who joined us partway through last year from an Outstanding school, said “this is the best behaviour system I’ve ever seen”. And our results have gone up and in no small way is this down to the improvements over the last year – even in a year the improvements had impact – despite the attainment profile of last Year’s (2013) Year 11 being the lowest in the school’s history (and will now continue to decline for some time), we achieved our highest results and a raise of 13% in the Headline figure. Our Maths pass rate is a stunning 73%, Spanish 96%, and History, Art and Science all very strong. English had a difficult year, but maintained a decent performance despite the students being weaker on entry. Teaching is harder, because there is LOADS more marking to do, and the students are more demanding academically. It also feels like just the start. We just don’t know the potential of the school now. Attendance was 91% over a year ago. It’s now 95% (even though a significant proportion of absence is exclusions). One final note – I’ve written here about behaviour, but not about reward systems. We have a similar system of “achievements” and a points system. Students get badges (which they really want) for their uniform, and school pencils/pens/pen set/ usb etc for achievement. I don’t believe that rewards and sanctions are two sides of the same coin. The latter has been one lever (and our second* most effective one) to turn the school around. The former has been nice. We haven’t got everything right yet (there are still pockets of frustration, some colleagues don’t always play their part [though I’ve come to the conclusion that it is the Leadership Group’s job to manage behaviour full stop (the pressure of this largely falls on pastoral leaders and we haven’t got this right yet)], we still haven’t got 100% attendance to all parents’ evenings). We’ve just said something simple (we won’t tolerate poor behaviour), meant it, and proved it. And as a result, I actually want OFSTED in. I am more than comfortable justifying our astronomical exclusion rates. post script: This has been the movement of a school with the same staff, (mainly) the same leadership group, and the same students. The difference was that we had no LA consultants and we started listening to staff. It sounds like I take a lot of credit in this post, but actually, it’s been the staff whom, when given permission and structure, have consistently dedicated themselves to transforming the school so significantly. * I’ll blog on the most effective lever another time, but for reference it’s the change in curriculum. Fantastic. Almost exactly what I would have done, (did do, actually). Justifying high exclusion rates to Ofsted is one thing, but what about the kids you permanently exclude? Do they go to other schools? Or is it the job of the local PRU to make sure these young people achieve something in life? Knowing the nature of PRU’s, and although the staff have the best will in the world, along with drive and determination to help young people, the kids really do ‘run a muck’ with high percentages of them working with YOT’s, NACRO and other agencies. Or past that point, is it no longer your responsibility and/or worry? Very few go to the PRU, though some do. Waltham Forest’s Fair Access Panel is praised nationally. We have done wonders this year with those we’ve received from other schools, mainly because our line is so clear. In addition, we have a weekly Multi-Agency panel and the intervention teams and provision across the authority is now based in our school (Child and Family, YOT and community police, 722, social workers, counsellors, we’ve had to train our own ‘EWO’). ie we support students to meet the high expectations. We also have the mentors from the PRU come to school to work with those we’ve taken out of the PRU. Oh, and the Executive Principal is on the Governing Body of the PRU. You kept your nerve. That’s the difference. We had quite a heated discussion on Twitter last night, you and I, and I’m sorry if I’ve offended you, but I am still unclear about what happens to the students who are excluded in “astronomical numbers”. This is your term, it is startling one from an outsiders’ point of view, but it is one you say you are comfortable with, so I make no apologies for using it. From your answers on Twitter (not the best format for conveying large amounts of complicated information) I got the impression that most of these children came back to your school, after a period of exclusion, and settle down complying to the new regime and improving academically. Is this right? Because it is not made clear during the blog and makes a huge difference to how your strategy is working. I agree it would not be ethical to use precise numbers, but could you give me an idea in terms of percentages? What I’m interested in is what happens to the children who go through the system you have developed. The results for those who stay in school seem very encouraging, so that is obviously very good. But, could you please give me an idea about the outcomes for those who are excluded, the percentages of those that come back and stay in school, those that find another school, and those that don’t, etc? For me as a primary school teacher I don’t encounter these kinds of large scale problems with behaviour, so it would be easy for me to criticise what you are doing, I’m not going to do that. But, I am also a governor in a secondary school, and if you are saying (which I think you are by reference to your brother’s experiences) that excluding disruptive students is good both the children who stay in the school and for those who are excluded, then that is a very interesting notion, and not one I’ve heard before. If excluding disruptive children results in good outcomes for them (as well as the schools they leave) then there seems no downside and all schools should adopt your strategies. Tim – Your post is hard to reply to. Partly, because of obvious reasons, and partly because I feel like I’ve already replied and you continued asking the same questions. And have done so again. Yes, there is an astronomically high number of exclusions over the last year. That is something we will have to defend when inspected and I am comfortable doing. I have made it clear to you this is not the same as “astronomically high numbers of students who leave the school”. You seem not to believe me as I’ve told you this already. You are now asking for a percentage rather than a number. I’m not going to give that, because it would have the same effect. If you don’t believe me, then fine, but please don’t ask again. Most students who have been excluded once or twice are meeting our new higher expectations. There are some students who have been asked to leave our school. Their destinations (and again, I have answered this directly) are decided by a 4-weekly meeting of Heads in the authority. These cases are discussed at the highest level. Our Assistant Head also attends, and I retweeted some of his tweets for you last night. Destinations range from alternative provision (we have a member of staff who visits), a chance in another school via the Fair Access Panel (who we receive students from as well and has been praised nationally), our sister school under the Academy Chain, or to the PRU. Very few end up at the PRU permanently. Now I’m clearly not going to go through cases with you, and I am sure you wouldn’t want me to. But the point of that part of the blog is that this difficult decision is one that we do not shirk from. When I asked our Assistant Head to read the post “to check for exaggeration” he said that I should write another one talking about the effect of the Fair Access Panel. I’m not sure that’s possible to do without writing about individual cases, but I do think I can do a post about what we do to ensure the best possible outcome for individuals, as well as ensuring that our high expectations stay high. The only thing I don’t think I directly answered is your last point. I think it is exceedingly damaging for students to learn that “the line” moves. It was for my brother. Our SPL for Year 11 (who has seen 5 year groups through) said “my work at keeping kids here has meant a lot of them have made mistakes outside of school” – and he was referencing prison. It would be foolish of me to suggest that a permanent exclusion is a positive development for a young person – statistics suggest it isn’t (though there is a problem with the assumed cause and effect here) and clearly individual students do best being taught by qualified teachers to improve their life chances. But I maintain that a school that has no line, no ultimate sanction, teaches young people that it will continue to be like that in society – and that’s not a lesson schools should be teaching. So I think we should have the line. Full stop. Then work our backsides off to ensure that students are able to manage their behaviour to ensure they don’t meet the line. I was delighted to read how clear structures and keeping to them with no exceptions; in short,holding your nerve. resulted such a turn around for your school. In 2 places I have taught or rather tried to teach, chalk face staff were ‘screaming’ that the behaviour was the challenge and that bouncing management of it back to teachers who followed all the procedures was not effective. Sadly the screams fell and continue to fall on deaf ears. I hope someone shows the SLT teams this blog so they can be reassured that they can turn their schools around and enable the rights of both teachers and learners to be met. It broke my heart to see and hear pupils giving up trying to learn because no one else wants too. I had bouts of depression and anxiety in both schools despite or because of, being committed to working in challenging circumstances. I had to bail out for my own health. Your actions will save much anxiety amongst your staff- a further benefit to your students. I am full of admiration for your SLT for looking the elephant in the room straight in the eye and leading it out. Thanks Fiona. I’m sorry about your experiences. Sounds depressingly like the way we used to work, though we had the best of intentions. I don’t think any SLT want kids to misbehave. Really enjoyed reading this. A lot if schools would like to take the line you have but would lack the confidence or be influenced by external pressures too much to follow your lead. Good to hear from someone who clearly believes behaviour underpins everything a school achieves. Good luck and I look forward to reading of future success. From a personal perspective, I have to shoulder considerable blame for the way behaviour was allowed to be recycled in the way that I outlined above. I took the not uncommon view that entertaining engaging lessons dealt with most behaviour problems, that relationships were key, and that people should deal with whatever happens in their classroom – while SLT dealt with the most extreme cases. I’m glad it’s changed, but I regret that it took so long. I find it staggering that’s there were 280 different pupils during the year in a cohort of 165. That must be beyond a logistical nightmare. My own feeling on permanent exclusions is that they can be very damaging for the individual (an obvious view I know). However, I also know that sometimes they are necessary. A school has to be able to “look at itself in the mirror” and know that they had not done the easy thing but had done the right thing. I also think only those that work there can truly justify if it was the right thing. Thanks for sharing this. It is very thought provoking. The improvement of the school does sound quite incredible. I take it that the 3 2 1 strategy and slant have given the classroom simple routines and something for staff to defend. 280 over the 5 years, but nonetheless a huge challenge. 3.2.1 has been in use a while (and was always a decent strategy/ policy if dependent on who was using it (and that’s not good enough) – it’s only changed since not abiding by 3.2.1. and receiving a behaviour point is actually something students don’t want any more. Thanks for the comment. The school name is actually in one of the images, so you didn’t have to go to the trouble of googling me. Very sorry that I wasn’t clear. I meant 2 of our current Year 7 (and qualified that I’m not actually sure, but I’ll check). You’re quite right regarding 2012’s Year 11 – massively underachieved and were supposed to be our best cohort ever. 2013’s, not so much. You’ll be able to see that when the new performance tables are released in January. I just want to defend myself a bit more on this actually – the deprivation “top trumps” you refer to was to establish that we’re definitely a challenging school. I think it’s relevant. It’s also fair to say that even if 2012’s Year 11 cohort had been replicated across the school, though it’s not at the most challenging end of an intake, it is nonetheless not average. The average intake is not a fairly normal distribution, so I understand (the DFE performance tables for 2012 say nationally 17.1% Low ability, 33.1% high ability, so that intake was fairly challenging by national standards – and still our best ever). And as I said, on all measures in the first page of RAISE we were in the most challenging quintile – even with that 2012 intake (which is what our last RAISE was based on). I also am aware of the possibilities of hyperbole when writing proudly about one’s own school – that’s actually why I got one of our Assistant Headteachers to check the post for exaggeration. This is a fascinating post on many levels. My personal feeling is that there has to be consequences for behaviour – we are way to ready to make excuses for bad behaviour and it seems that you and your staff have very effectively changed that. Permanent exclusion is the last resort and should not be used willy nilly (and it is obvious that you don’t) but it has to be there. We need to provide the best learning experience to as many students as we can and one or two disruptive students can stop that happening. Really impressive article. That great Bill Rogers quote “The certainty of the consequence is more important than the severity” comes to mind. A great post. As I was reading it I was thinking “now that is what leadership is all about”, especially the bit that talked said “the Leadership Group’s job to manage behaviour full stop “. It’s not that teachers can absolve themselves of responsibility but clear rules and lines are I feel key for both teachers and students. I worked in a school in which a similar system was put in place and it made a big difference to school life although ours was perhaps not supported quite as well by staff and was maybe only 80% effective. That last 20% made a difference. Having to defend the number of exclusions to OFSTED is an issue to me but that is for another time. As an 18 year teaching veteran I can well believe that there are a great many schools in which a similar system will transform school life. As I read your post and reached the “Waltham Forest” part my perception of the post changed as I also went to school in Waltham Forest. Walthamstow to be precise. I then saw the name of the school. I left school there 38 years ago. I didn’t do so well at school. I was labelled as a high achiever, but alas I was never one to remain on the rails. I should have taken the opportunity to become a professional darts player in hindsight. I was very a very good darts player due the to time spent in the local snooker hall. If I had been at your school these days it is likely I would have been excluded quite quickly. In hindsight I am fairly sure I would have made better progress as a young person if firm and decisive action had been taken in my case. I was quite happy going in during the day, disrupting lessons, making teachers cry where possible and generally interupting the attempts of others to work. Having left school I found my niche and did ok, but a number of my brothers in arms were not so lucky. Rather than justifying to OFSTED why you exclude students, I feel that OFSTED should be explaining to you why there is not adequate alternative provision for those who would disrupt the school life of others. To paraphrase Covey in the 7 Habits of Highly Effective People, if you try to extend yourself to the things out of your circle of influence you will likely not be effective. Those who are excluded stay in your circle of concern but they are indeed someone elses problem. To take responsibility for that outside your circle of control is a recipe for disaster as it is with behaviour policy in many schools. I regularly visit Waltham Forest and I would be interested to know whether strangers are able to arrange for a short visit. I would be fascinated to see your policy in action and also your “curriculum”. I fear that it might have me reading more Hirsch but I would take the chance. I am not sure who you are. If you chat to me on twitter, let me know you’re looking to visit.